Part of the reason I bought replacement flour, demerara sugar and golden syrup during my June store cupboard challenge was because I was writing an article for the Mirror Online about cakes. 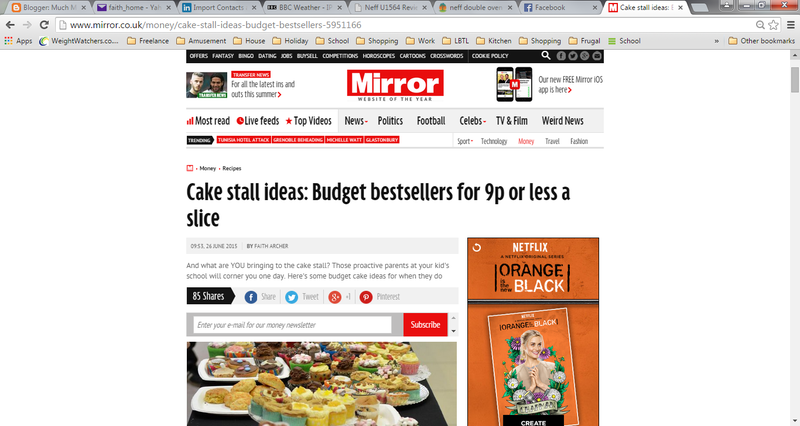 So if you’d like to read my suggestions for quick and easy budget best-sellers when cornered about the cake stall for whichever fundraising school / church / Brownie summer fete is coming up next, you can find the article here: caketastic. Nothing to scare the horses though – I wrote about fairy cakes, chocolate cornflakes cakes and flapjack, as they are all fast, cheap and you can get the children involved if you can face that degree of chaos in your kitchen. The entertaining part came shortly after the article went live on the Mirror Money website. I got a call from a PR, saying that if I wrote about budget food, would I like some samples of the product she represented plus some recipes for inspiration? So now I have a full freezer again. And we’ve had a go at Quorn burgers, served as pretty trad cheeseburgers with wholemeal buns, cheddar, lettuce and lashings of ketchup, and I used some chicken pieces in a coconut noodle laksa soup. Chilli con Quorn and Quorn fajitas are next on the list, and I’ll let you know how it goes. 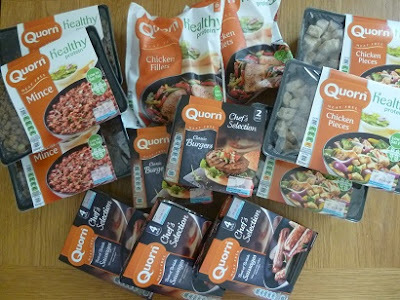 Any suggestions for tasty meals with Quorn? Do you ever use it as a less expensive alternative to meat? I’d love to know and have a lot of cooking with Quorn to look forward to! I make up batches of Quorn in a bolognaise style sauce and use it to make both spaghetti bolognaise and lasagne. Wow ….. lucky you. I simply use Quorn wherever I would previously have had meat, so pasties, curries, stews and burgers. I also love the 'chicken fillets' speared with slivers of garlic and cooked with rosemary. I find the mince works best for me in spaghetti bolognese and chilli and I don't mind the sausages, which I sometimes use as is or in a casserole. Not so keen on the meatballs, but Sainsbury's do their own brand of vegetarian meatballs that are much more preferable. I haven't used the chicken pieces in many years, but I did used to like them. To be honest I don't advertise the fact that I use this instead of meat sometimes to anyone in the family and so far they haven't actually said anything about it, so I'm assuming they haven't even noticed. I might be wrong though.